Bar Traffic Light | OhGizmo! Pool table, check. Poker table, check. Swanky bar stocked with liqueur aplenty, check. All you’re missing now in that basement of yours is this dandy traffic light. Telling your pals the status of the bar has never been easier. 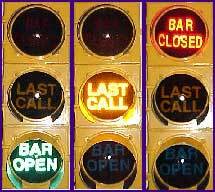 Just switch the light from “Bar Open”, to “Last Call”, to “Bar Closed” to simply and easily solve that awkward problem of just how to kick everyone out gracefully. This particular model comes in 8 inch sizes and costs $225. that is so cool!! Maybe I should get one and change for when I am on the phone. Hmm, what the local bar needs!Wouldn,t that look kewl!